Vehicular progress along the Puttalam - Mannar road has been halted due to flooding caused by heavy rains. 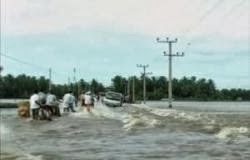 Assistant Managing Director of DMC of the Puttalam District R.K.A Ranaweera said that the Eluwankula Kosawe area had been flooded to about three feet. He requested the public to use alternate routes.